Scientists working in the desert badlands of northwestern Kenya have found stone tools dating back 3.3 million years, long before the advent of modern humans, and by far the oldest such artifacts yet discovered. The tools, whose makers may or may not have been some sort of human ancestor, push the known date of such tools back by 700,000 years; they also may challenge the notion that our own most direct ancestors were the first to bang two rocks together to create a new technology. The tools “shed light on an unexpected and previously unknown period of hominin behavior and can tell us a lot about cognitive development in our ancestors that we can’t understand from fossils alone,” said lead author Sonia Harmand, of the Turkana Basin Institute at Stony Brook University and the Universite? Paris Ouest Nanterre. Chris Lepre of Columbia University’s Lamont-Doherty Earth Observatory (back to camera) precisely dated the artifacts by analyzing layers above, around and below them for reversals in earth’s magnetic field. Lepre’s wife and another co-author, Rhoda Quinn of Rutgers, studied carbon isotopes in the soil, which along with animal fossils at the site allowed researchers to reconstruct the area’s vegetation. This led to another surprise: The area was at that time a partially wooded, shrubby environment. Conventional thinking has been that sophisticated tool-making came in response to a change in climate that led to the spread of broad savannah grasslands, and the consequent evolution of large groups of animals that could serve as a source of food for human ancestors. 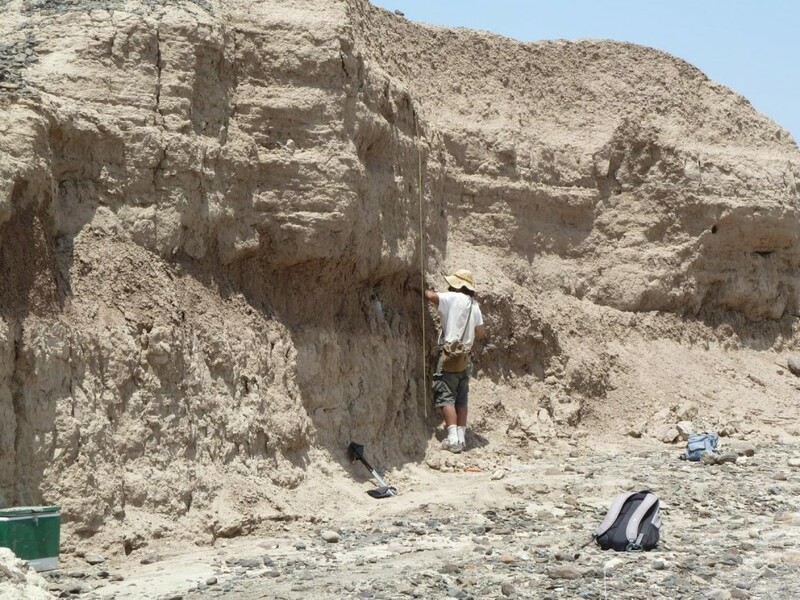 One line of thinking is that hominins started knapping – banging one rock against another to make sharp-edged stones – so they could cut meat off of animal carcasses, said paper co-author Jason Lewis of the Turkana Basin Institute and Rutgers. But the size and markings of the newly discovered tools “suggest they were doing something different as well, especially if they were in a more wooded environment with access to various plant resources,” Lewis said. The researchers think the tools could have been used for breaking open nuts or tubers, bashing open dead logs to get at insects inside, or maybe something not yet thought of.